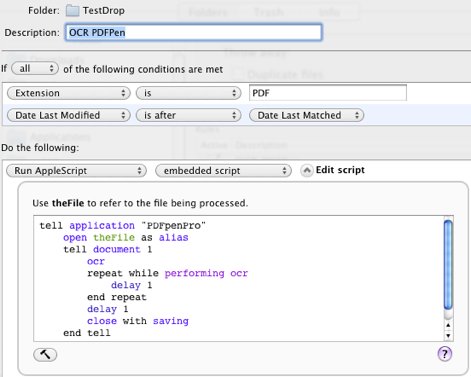 The other day I posted an Applescript to OCR documents using PDFPen. In the comments, awesome DocumentSnap reader Josh requested that it be done as a Hazel rule instead. Given that my love for Hazel is well documented, I am happy to oblige. Of course, if you are using PDFpenPro, replace the first line with “PDFpenPro”. Hope this helps out you Hazel and PDFPen fans out there. Enjoy. Thanks for this Eric. I copied and pasted your script but when I compile the script, I get an error “Expected end of line but found identifier” and the word “ocr” is highlighted at the end of the line that reads “repeat while performing ocr”. Is something missing from the script? I have a problem with PDFPenPro not playing nice with my scanned documents: unless I SAVE first, the OCR image does not line up with the actual text image. I spoke with PDFPen and they said it is a bug they will work on. But for using AppleScript and Hazel, the solution should just be to get the script to run a SAVE command, then go forward with the same script as posted. I do not code, or know AppleScript specifically….can someone tell me what that would look like? Do I have to compile the script… What’s the use of the little hammer-button ? Dumb question, but do you have PDFpen installed? If so which version? I use the “Searchable PDF Converter” that came with my Fujitsu ix500 scanner. How do modify the script to use this software to OCR my PDF files? We were having trouble getting it to work. The solution we used was we created a droplet and had a shell script launch the droplet. anybody got a fix for the already scanned documents issue? So what is it that you are wanting Klaus? You want the Hazel rule to ignore the document if a document is tagged with “ocrd”? Wow, thanks a lot. This really helped me. This works great with the new PDFpenPro 6. Thanks very much! I don't know if this is new in 6, but every document comes up with a language selection dialog (english, spanish, etc.). This doesn't seem to impede the progress of the OCR. I think. This used to work perfectly, but now I've just tried it and it saves the document with no extension. I've not changed anything in the rules, can anyone help explain whats changed? 2012-12-06 17:29:27.035 hazelworker Screen Shot 2012-12-06 at 3.22.11 PM.pdf: Rule OCR documents matched. 2012-12-06 17:29:27.057 hazelworker [Error] AppleScript failed: Error executing AppleScript /Users/VictoriaMacPro2012/Library/Scripts/Applications/OCR scripts/Hazel and PDFPen rule.scpt on file /Users/VictoriaMacPro2012/Documents/ITEMS TO OCR/Screen Shot 2012-12-06 at 3.22.11 PM.pdf. It looks like you're executing an external script. I'd try embedding it in the rule, or if you don't want to do that for whatever reason, check the Hazel help on AppleScript. You need to have a special handler in your script that you may not have. Riley above makes an excellent point. Also, not sur eif related or not, but I find that the measure taken to prevent repeat scans of docs already scanned isn’t working for me. Want to OCR PDFs that are downloaded using PDFpen, automated with Hazel 3.0. I noted that the posted Applescript does not handle the need to depress the option-command buttons when selecting Edit so that the OCR menu is available. I do not know how to write Applescripts; what needs to be added to the the posted script? Hi, I tried this with PdfPen Pro and Hazel. Unfortunately something appears to have failed. @Hayle – did you use the "PdfPen Pro with Hazel" method? What's happening? What message are you getting? Lion, Snow Leopard, …? I will describe what I have done as soon as I can get to it. Thanks for offering to help again! Hoping to get an easy enough system which does OCR in the background without taking control of the screen. That hits the target pefrclety. Thanks! Fair enough. I guess I will either accept the size increase or simply do without OCR. Been managing alright without OCR. Hi BrooksD, thanks for running such a useful site on a topic where little information exists. i successfully used the script that you have linked to – using folder action as advised on that page. came around to it today. one issue – the resultant file size is still about 50%+ higher than the original. does adding text to a pdf really have to increase the size so much? or are there more efficient (as measured by file size) approaches to OCR? Hi sims, OCR will typically add some size to PDFs. I know that some people run their PDF through Acrobat after OCRing to reduce the size. There is an Optimize PDF command or something. I also know that PDFPen has a Resample Image command under the Edit menu that will reduce the size, but I haven't played around with that. Maybe if size is a big concern you play around with it and then find out from Smile if there is some way to work that into an Applescript (I'm not sure). i will update my pdfpenpro and report. hey thanks for responding so quickly! i tried the new script. "Updated July 1, 2009 – I’ve updated the script to require PDFpen 4.1.4, which has some new OCR functionality in the AppleScript dictionary. No more GUI scripting!" So, from that, I have a feeling that your old-ish version of PDFPenPro (4.0.4) doesn't have the new OCR functionality.. that probably explains what is going on. Also, with respect to the window being in front. With the Acrobat script it would definitely not be possible because it is GUI scripting. With the PDFPen script, it might be possible? I am not enough of an Applescript guru to know off the top of my head but if I get some time I can try to dig into it. Hm I am not sure, I found another script out there <a href="http://(http://carpeaqua.com/2009/01/08/automatic-ocr-conversion-with-pdfpen-and-folder-actions/)” target=”_blank”>(http://carpeaqua.com/2009/01/08/automatic-ocr-conversion-with-pdfpen-and-folder-actions/) and ripped out the part that should apply to Hazel. I haven't tried this myself but maybe give it a shot embedded? This concept does work, but the syntax in the post was incorrect. — set a reference to the file in case there are other PDFpen processes running.